Thirty three down. Twenty two to go. Tacoma Musical Playhouse is a wonderful example of an arts organization that fills an important niche in its community. 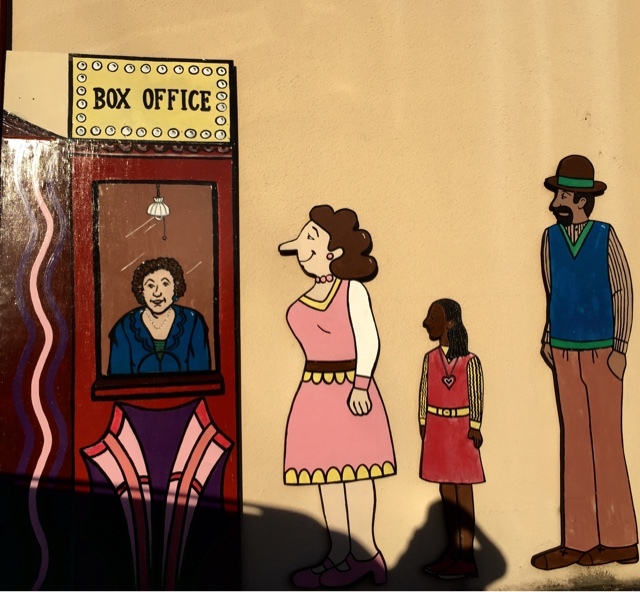 The community is Tacoma and the niche is musical theater performance and education. We recently asked a friend who is raising a family in Tacoma if she knew about Tacoma Musical Playhouse. "Of course!" she replied. Turns out they have season tickets, and a good friend's daughter starred in a recent TMP production. 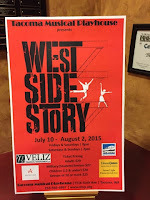 West Side Story featured an energetic young cast and an enthusiastic full house. As Tacoma's only dedicated musical theater company, TMP taps into a pool of strong local talent. TMP's home is the Narrows Theater (near the Narrows Bridge) and it is obvious when you walk through the door that the Company enjoys a great deal of community and volunteer support. TMP was founded by Jon Douglas Rake in 1994 with a goal to enrich lives through musical theater. Its upcoming 2015-2016 season will feature seven productions, with four additional shows in the TMP Family Theater series. The organization also has many educational programs, including early acting camps for children and classes in acting and dance for young people up to age eighteen. The theater offers three five-week "After School Academies" and youth camps during school breaks, all of which culminate in a musical theater performance. The educational offerings also include a senior-theater program, The Young at Heart Players. 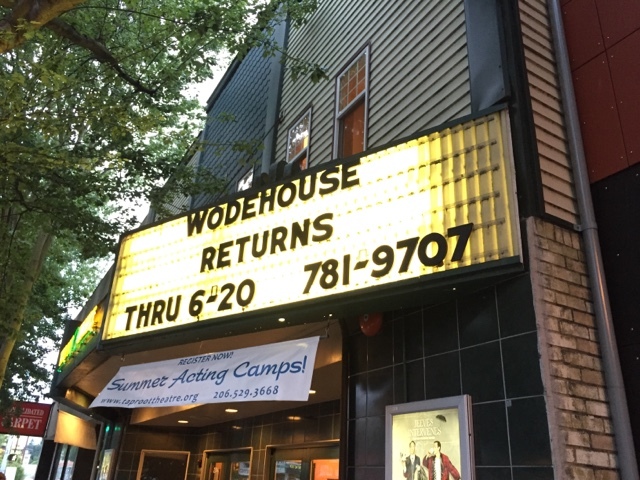 In addition to benefitting from regular ArtsFund grants, TMP recently raised the money for a bright new box office sign outside the theater through ArtsFund's Power2give program. and fanciful art on the building. Thirty two down. Twenty three to go. Taproot Theater is a great venue for live theater. 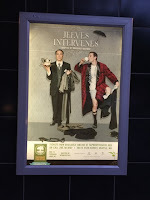 We bought our tickets for Jeeves Intervenes at the last minute, and though they were certainly not the best in the house, they were still great. Even at the back I felt close to the large thrust stage and connected to all the action and fun. Jeeves Intervenes had plenty of both, including hilarious rapid-fire exchanges, physical comedy, and the slick plot twists that are all hallmarks of P. G. Wodehouse on stage. A Huff Post review captured it well: "Crisp, Witty and Intimate." Founded in 1976 by six friends, five of them Seattle Pacific University graduates, the company now serves over 150,000 people annually throughout the Pacific Northwest. 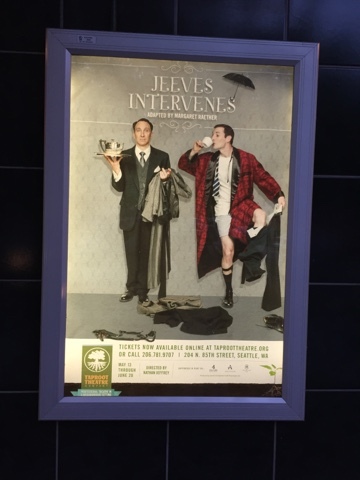 Taproot's programs include the Jewell MainStage season, which featured this production of Jeeves Intervenes, and the Isaac Studio Season in the company's 120-seat black box theater at the same Greenwood location. Taproot also offers a family-oriented Touring Program for schools and other groups, and the Acting Studio, a year-round program with classes for theater artists of all ages and experience. Our family has a true P. G. Wodehouse nut in it, our beloved Aunt Fran. She inherited a life-long passion for the books from her father, has read most of them several times, and never misses a chance to see Jeeves on stage. Well, almost never. This time she was happily busy with new twin grand babies, which can also be lots of fun and full of physical comedy! Missing Jeeves Intervenes, however, was her loss indeed. is a great venue for live theater. Thirty one down. Twenty four to go. 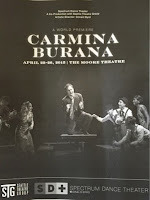 In his glowing Seattle Times review, Michael Upchurch said that Spectrum's Carmina Burana tapped "the primal energy of the piece with a fierce, unornamented commitment". Although not qualified to be a dance critic, I certainly agree. In addition to the wonderful and diverse choreography, the piece showcased Donald Byrd's theatrical skills with a powerful blending of voice and drama as it told a compelling human story of descent and redemption. Spectrum Dance Theater's ambitious Carmina was actually the second Spectrum performance we have seen this year. The first, Carousel, was a collaboration with the 5th Avenue Theater. Spectrum has an impressive record of such collaborations. In addition to Carousel and Carmina Burana (produced with Seattle Theater Group), it includes programs with the Moore Theater, Northwest Sinfonietta, Music of Remembrance, Seattle Men's Chorus, the Seattle Art Museum and Seattle Opera. Founded in in 1992, Spectrum Dance Theater has been under Donald Byrd's visionary artistic leadership since 2002. Spectrum seeks to make dance broadly accessible through contemporary performances and high-quality dance training in many diverse styles. It has a professional company that has performed throughout the U.S. and in Europe, a dance school serving over 500 students of all ages, and community programs that include providing over 120 hours of dance education in local schools. In addition to annual ArtsFund support, Spectrum raised funds for free and reduced student tickets to Carmina Burana through ArtsFund's Power2Give.